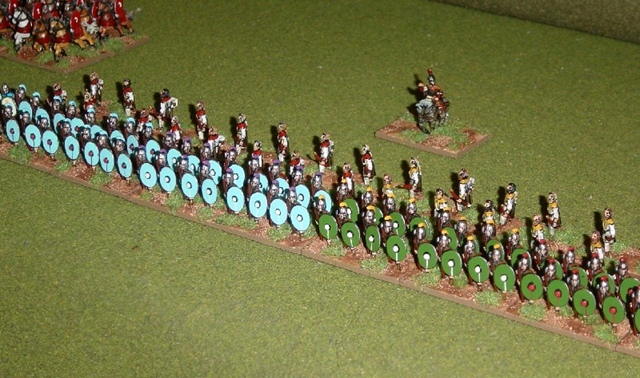 This is the first of a series of posts to the Hole covering Thomo’s Armies (OK, for some of my readers, Thomo’s Toys!). 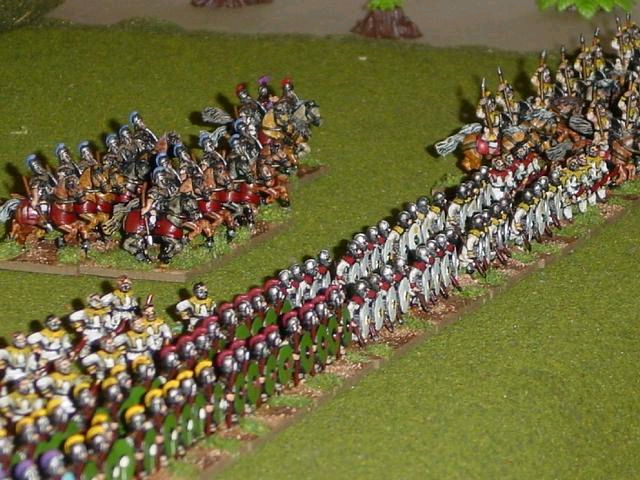 The Late Romans I have are in 15mm and made up of Essex Miniatures. They are shown to the right laid out. The single figure to the rear is the Commander in Chief of the army. I originally built this force for use with the DBM rules from the Wargames Research Group but have never got around to using them. I can’t claim the credit for painting these either. They were painted by Emily Barr (I think it was Emily) – one of Tony Barr of East Riding Miniatures’ children. His son also painted some of my armies. Here the legion is deployed with light infantry archers in support behind the legionaries awaiting the arrival of some nefarious enemy or other. I should get around to reorganising this army for DBMM. I’ve looked through the other mainstream ancient wargames rules, Field of Glory (FoG) but haven’t got around to playing with them. I suspect that the figures I have for here will work just as well in a FoG army if I even get around to playing that. The good thing is that the figures can also be used for DBA. The last image here is another view of the main battle line with support. Here most of the cavalry can be seen as well as a good percentage of the infantry. The surface these troops are deployed on is the Games Workshop games mat – a really good surface for wargaming on.